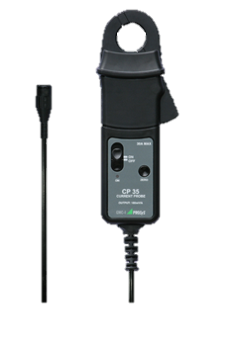 The AC/DC current probes and clamp meters have been designed for use with multimeters and oscilloscopes for accurate, non-intrusive measurement of AC, DC and complex currents. Using advanced Hall Effect technology the AC/DC current probes can measure currents accurately with a resolution of 1mA from 5mA to 1000 Amps over the frequency range of DC to 100 kHz. This makes it a powerful tool for use in inverters, switch mode power supplies, industrial controllers and other applications requiring current measurement and/or waveform analysis. The METRAHIT ENERGY is a compact power meter for direct and alternating current in single-phase systems. The electrical circuit can be connected either directly, or via a current transformer. If a current transformer is connected to the multimeter (mA/A input), all current and power displays are represented with the correct value based upon the selected transformation ratio. Universal power measurement includes the following measuring functions: active, reactive and apparent power, power factor and energy.